Orthodox Patriarch Bartholomew I of Constantinople has said that he is prepared to recognize the primacy of the Pope-- although he does not accept the Catholic position on the implications of that primacy. In an interview with a Bulgarian television network, the Orthodox leader-- who is himself recognized as the "first among equals" in the Orthodox world-- indicated his support for a statement released by the joint Catholic-Orthodox theological commission at an October meeting in Ravenna, Italy. That statement had recalled that during the first Christian millennium, the Bishop of Rome was recognized as the foremost of the patriarchs. 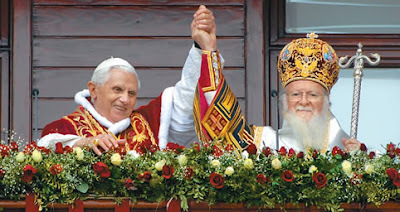 Patriarch Bartholomew went on to say, however, that he does not believe the primacy enjoyed by the Pope in the early centuries of Christianity included authority over other patriarchs. The primacy of Rome, he explained, involved precedence of honor rather than disciplinary status over the world's bishops. The Orthodox have acknowledged the Primacy of the Pope in the Ravenna document, as Catholics we should build on this and give them the Easter Date. In 2008 there will be 5 weeks between the Dates of Easter, Catholics & Protestants will celebrate Easter on the 23rd of March and the Orthodox will celebrate Easter on the 27th April. Why Vote to Celebrate Easter all in one date? Simply, because as one Christian family we are divided on this matter and our division is a sin. When we cannot agree to celebrate the Feast of the Resurrection on the same day, how can we hope to be a sign of Peace and Unity to the world?